At the very outset, let me state that I am pretty confused. Hence, I expect no clarity in this article. Rather, it is an attempt to thrash out my ideas and hopefully try and figure out where I stand. Lance Armstrong – A fallen Hero! There are not many stories that captivate more than those that talk of fall from grace. The bigger the hero, the greater is the impact. Lance Armstrong was not just a hero; he was an inspiration to millions from across the globe. Armstrong conquered mountains, overcame death; Armstrong defeated opponents, vanquished cancer; Armstrong battled exhaustion, endured pain. And in doing so, he won a million hearts, set in motion countless dreams and captured the imagination of many more. Armstrong, a hero, if there ever was one. Did Armstrong cheat? Did Armstrong take drugs? Honestly, I do not have a clue. What I want to explore though is how people’s perception of Armstrong will be affected by the accusations. To be honest, today, they are more than accusations. By refusing to fight further, Armstrong, at least in the eyes of law, is a cheat. But does it really matter? Does it make him any less a champion? Does it make him any less an inspiration? Firstly, the appeal of sport lies in the assumption of a level playing field. Sport relies on the trust it builds with the spectator. The moment this trust is broken, sport loses its meaning. It is reduced to a mere kicking of the ball or a hurling of an object, etc. It is stripped of its very essence, i.e. the celebration of human spirit. Any athlete, when he indulges in foul play, especially doping, does a great disservice to his sport. Armstrong, if guilty, is no different. But Armstrong the fighter will continue to inspire. Here is a man, who in the prime of his life is diagnosed with the most belittling of diseases; Testicular Cancer. He is given less than an even chance to survive. Overnight, the world crashes around him. The world at his feet, literally; and a diagnosis later; he stares death in the face. The fighter that Armstrong is; he battles pain and conquers death. Mind you, he did not ‘cheat’ death, he conquered death. He not only conquered death, he had the audacity to dream. He believed that a cancer survivor could master the Tour De France. For the thought alone, Armstrong is a winner. But he went further; he actually did win the Tour De France, a record seven times. Having just battled excruciating pain, he chose to court pain yet again. He chose to succeed. Drugs might make you a superman, drugs might beef up your body, drugs might give you super-human strength and endurance but no drug in the world can ever give you the spirit that Armstrong possessed. This was achieved by Armstrong alone. The greatest victory of his; none can take this away from him, even if they so desire. And yet, incredibly enough, this is not Armstrong’s greatest achievement. Armstrong’s call to fame lies not in what he has achieved but in how he has made it possible for others to achieve. A book that inspired millions and a foundation that helped cancer patients; Armstrong’s legacy in the pantheon of American heroes lies secure. And so I come back to where I have started. Does it matter? Does Armstrong remain a role model? It boils down to the age-old adage; Take the good, Leave the bad. Accept the man for what he is, for what he has achieved and learn from his mistakes. 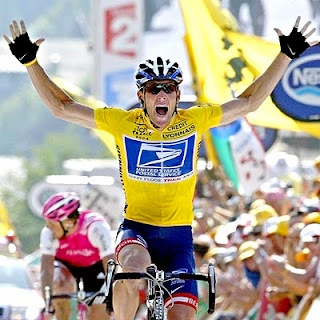 Lance Armstrong for all his flaws, for all his shortcomings will remain an inspiration for many a year to come. After July21st, 1969, When Neil Armstrong set foot on the surface of the moon, it is incredible that, today, to many the name Armstrong conjures up visions of a yellow jersey hurtling down mountains rather than the landing on the moon. It is ironic that Neil Armstrong died just two days after Lance Armstrong gave up a fight for probably the first time in his life.